What an up and down week for our rookies, one had a huge 2nd half comeback at home, another jumped out to an early lead only to see it disappear. While we had our 1st new sighting of the season, but at the expense of one of our usual 5. The matchups this week weren't great. Indianapolis and Andrew Luck, with their head coach Chuck Pagano in hospital, had to host Green Bay. Washington were playing the undefeated Atlanta Falcons while Brandon Weeden travelled to the defending champs in New York. I'm running out of ways to describe Luck's play. He looks like he's been playing in the NFL for years as opposed to weeks. He has a clock going in his head at which point he begins to move and slide with great proficiency. He did take one heavy shot from an unblocked Nick Perry that was on instant pressure from his right. Otherwise though he was mostly fine, in 64 total drop backs Luck was sacked just 4 times in total. ﻿ He was under more pressure in the first half than in the second, when Indy started using his feet more on rollouts and bootlegs. But none of it seemed to greatly affect Luck's ability to throw down the field accurately. He missed a diving Donnie Avery by a hairs bredth on a good bootleg to his right. He was consistently able to get the ball down field to Reggie Wayne, who had a big day himself, as well as to other targets. He wasn't immune to errors however, making some dangerous throws towards the end as the game was getting close and the pressure was on. He had one interception dropped by Tramon Williams before Casey Hayward, who was in perfect position the whole way, picked him off down the sideline. But all in all this was a superb display from the #1 overall pick. He got himself into the endzone on a QB draw, using his power and physicality to get in, he then displayed it again, converting a 3rd & 7 in the red zone as he dove between two Packers defenders. I've talked already this year about Luck's poise in the 2 minute drill, and he showed it again in the 4minute drill at the end as they moved down field to get the game-winning score and left Aaron Rodgers without enough time to reply. After last weeks calls for Matt Flynn to take over from certain sections of Seattle and the media, Russell Wilson came out and played really well. He was on target most of the day, hitting receivers at every level, even if occasionally they were bought back for holding calls from the offensive line. 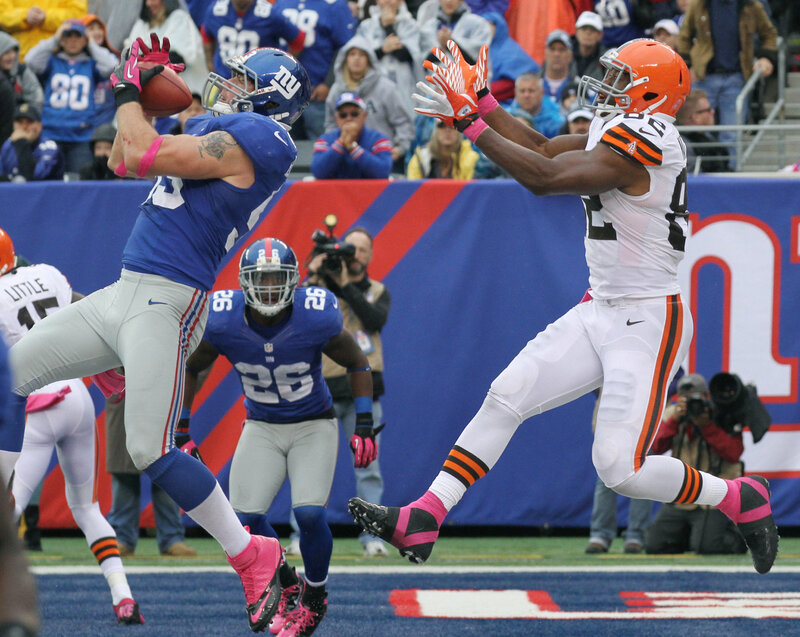 Wilson went 19/25 on the day, with a touchdown and 2 interceptions. The touchdown came on a quick slant to Golden Tate, Wilson hit him perfectly in stride and allowed him to carry on through the arm tackles of the Carolina defense. And the interceptions? Well there were no excuses on the 1st one this week. It was the same route that Anthony McCoy fell down on last week,and Wilson held the ball until McCoy was well out of his break, allowing Captain Munnerlyn to break on the ball himself and jump the route, taking the ball back for Carolina's only touchdown of the day. The 2nd interception was one of those where the QB is not at fault. 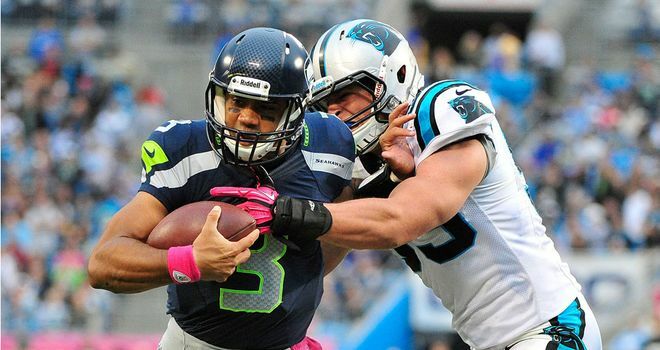 Wilson scrambled like mad behind the line of scrimmage, before eventually finding his check-down man Marshawn Lynch,only for Lynch to bobble the ball up into the hands of rookie linebacker Luke Kuechly. All in all this was probably Wilson's best performance for Seattle. Pete Carroll opened up the route tree somewhat for Wilson and it paid dividends in yardage and overall pass-threat in this game. Next week the Seahawks will be against the high tempo Patriots and their weak secondary, so opening up the playbook even further could well be on the cards. An up and down day for Weeden. Everything started really well for the Browns, going up 14-0 with a lovely Richardson TD run and then an impressive long bomb from Weeden. It was a good play-fake from Weeden and he launched the ball 55 yards downfield to Josh Gordon who had gotten behind the defense for a 61 yard score. It was really a perfect long ball, hitting Gordon perfectly in stride. After that one deep ball though, Weeden became a check-down king, targeting Richardson on a lot of swing passes & screens, as well as short passes to the receivers. On designed sprint right, Weeden fired a ball at Josh Gordon who couldn't handle it and he had it intercepted. He also Had a ball intercepted on a bad throw in the endzone after a bad moment from Weeden. He had a pass batted straight back to him at the line of scrimmage, and then rolled out and threw it again for a touchdown when he could have scrambled for some yards. He was rightly flagged for an illegal 2nd forward pass and on the next play was picked off by Chase Blackburn. Weeden came back and threw a beautiful 2nd touchdown to Josh Gordon in the 4th quarter, splitting Corey Webster and the safety on a go route. Despite the scoreline and 2 interceptions it was a good day for Brandon Weeden, he's still suffering from drops and a lack of receiving threats, but he's certainly making strides forward. 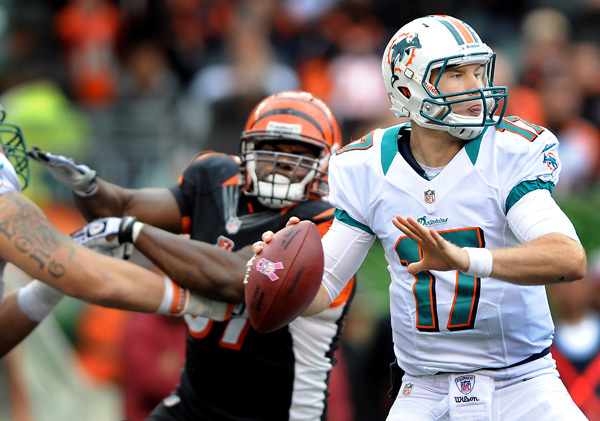 A solid if unspectacular day from Ryan Tannehill. He did a good job moving around and finding his targets, taking check-downs when they were there and rarely forcing anything downfield when it wasn't there. Tannehill spread the ball out nicely in this one as Cincinnati largely took away favourite target from last week Brian Hartline. Tannehill was able to spread 25 throws to 7 difference receivers on a good variety of routes, there was a lot of yards after the catch as opposed to downfield balls but Tannehill was largely on the money, going 17/26 and never really in danger of having a pass intercepted. But nor did he find the endzone, throwing just 2 passes inside the red zone, and none inside the Bengals 10, will always limit your touchdown chances. It was a day of consolidation after last weeks big performance, and really the result was all important after 2 oh-so-nears in back to back weeks. Miami now have what many will consider an upset under their belts before returning home to face those up-start Rams. Well, After weeks of running around Robert Griffin III finally found out what Michael Vick discovered early in his career: NFL Linebackers pack a punch. But before we talk about the injury, let's look at what was a very quiet day for Griffin's arm. Washington's gameplan was all about Alfred Morris and the run game. The aim was to keep Atlanta's high-powered offense off the field, and it worked pretty well. Griffin only threw 15 times when he came out with 5 minutes left in the 3rd quarter. And most of his throws were short, safe and chain-moving ones. But the reason he's down here is the manner in which he got hurt. It was a hugely preventable injury on a scramble right where he never had a chance at gettingback to the line of scrimmage. Griffin never once looked to throw it away or step out of bounds, but instead made a late slide and ended up taking a shot to the head. I've talked all year about the heavy hits that Griffin's been taking this season. Mike Shanahan had talked about Griffin needing to "run smarter". Well this wasn't smart, and he paid the price. It looks like Griffin will be back for week 6, but maybe he'll start to make that transition to smart running now. Welcome to the rankings Mr. Cousins! good to have you here, thought you were pretty good at Michigan St., nice to see you get some game time. Unfortunately, it wasn't very good. Now he was able to take advantage of a broken coverage to hit Santana Moss with a strike for a touchdown on his 2nd drive in the 4th quarter. But that was where the good play ended. He really couldn't move well and suffered under the pressure that Atlanta started bringing. His first pick came on a pass to Fred Davis that was caught by Dunta Robinson who was lurking in an outside zone, it was a nice play by Robinson but the ball shouldn't have been thrown as low and flat as it was. That pick came with 1:54 left on the clock and could have killed off the game, but Atlanta couldn't get a 1st down, so Washington got another shot from their 20 with 1:21 left, could Cousins lead them down the field? NO! He couldn't even lead them a yard closer, massingly overthrowing his receiver on an inside hook to close the game out. He was pressured and contacted, but it didn't effect the throw for me. Despite the 1st touchdown pass of his NFL career, it was a disappointing showing for the 4th round pick. Both interceptions were QB errors and ended a game that otherwise could have been a huge upset win for the Redskins.